Cynicism or struggle? Cynicism is self-fulfilling prophesy. The generation of 1968 fought - America changed. The changes didn't come easily. Every positive step was met with determined resistance. But we became better and stronger because we were determined to change. Today to make progress, to prevent slipping backwards - will require no less steadfastness, intelligence, and patience than was necessitated before. 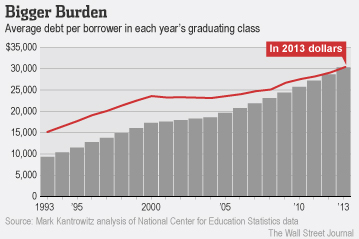 Graduates today are the most indebted - ever. When I graduated college I would not have believed that in my lifetime women would gain rights over their own bodies, including the legal right to have an abortion. Or women would become chief executives of major corporations, secretaries of state, contenders for the presidency. Or they outnumber men in college. Yet we achieved it. And we have just begun. Widening inequality, a shrinking middle class, global warming, the corruption of our democracy by big money - all of these, and more, must be addressed. To make progress on these - and to prevent ourselves from slipping backwards - will require no less steadfastness, intelligence, and patience than was necessitated before. $30,000: The average student-loan debt for a borrower who received a bachelor's degree in 2013. Total outstanding student-loan debt stood at $986 billion at the end of the first quarter of this year, according to the Federal Reserve Bank of New York. That's up 2.1% from the previous quarter and nearly 50% from the same quarter in 2009. The average debt load for each borrower receiving a bachelor's degree this year is about $30,000, according to an analysis of government data by Mark Kantrowitz, publisher at student-marketing company Edvisors. That number has doubled over the course of a recent graduate's lifetime. Even adjusting for inflation, the average debt burden was half that size 20 years ago. Other groups put the average debt figure even higher. 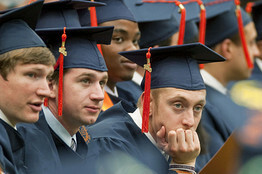 A poll from Fidelity Investments earlier this week found 70% of graduates had at least some debt, and the average was $35,200. That figure is higher in part because it includes debt owed to family and credit-card balances. No matter how you slice it, that's a pretty sizable burden to begin your working life. Of course, in general, a college degree is a worthwhile investment. The unemployment rate for graduates was 3.9% in April. Recent college grads aren't doing quite as well, as the jobless rate for 16-24 year olds with a degree was 7.1% in 2012, and many are stuck in low-paid jobs. But they're better off than those without a diploma. The unemployment rate for all 16-24 year olds not enrolled in school was 17% last year. The worst situation is faced by those who don't complete college. They get the burden of student debt without the benefit of a degree. The median annual income of a noncompleter from a private nonprofit four-year school was $25,000 in 2009 compared to $33,900 for a degree holder, even though both accumulated similar levels of debt per year enrolled. There is one piece of good news for the class of 2013: they aren't likely to hold the title of "Most Indebted Ever" for long. Amid continued growth in both tuition costs and student lending, they are likely to pass the mantle to the class of 2014 next May just as they assumed it from the class of 2012.